Reboot Restore Rx is a Freeware utility that makes it easy to maintain PC’s in small public access computing environments (classrooms, PC labs, kiosks, internet cafes, libraries, etc.). Every time you restart the PC’s - they will automatically reset to your desired baseline settings. 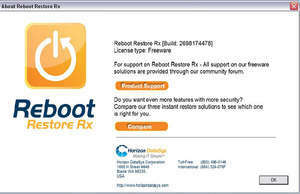 Reboot Restore Rx is a non-restrictive hard drive restore product designed for public access PC management. For security reasons, you should also check out the Reboot Restore Rx download at LO4D.com which includes virus and malware tests. Additional screenshots of this application download may be available, too. Reboot Restore Rx has a presence on social networks.